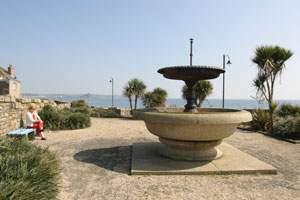 Penzance is a major tourism and holiday destination located on the south facing shores of Mounts Bay dominated by the granite heights of St Michaels Mount. Penzance is famous for its family friendly holiday beaches. It is also the regional centre to West Cornwall, acting as a gateway to the beautiful beaches and stunning landscape that makes this region of Cornwall one of the most popular destinations in the country. Penzance is also the main departure point for people travelling to the Isles of Scilly, which lie just off of the Corish coast at Lands End. An attractive market town that developed from a small fishing village, sheltered by a rocky headland - located in the area of the present day Quay. the town retains much of its original character and its location, close to a multitude of attractions and holiday beaches, makes it an exciting holiday base. Penzance owes its name ('holy headland' from the Cornish pen and sans) to the small rocky headland to the south of the harbour and the chapel which once stood just inland (on or close to the site of the present church). 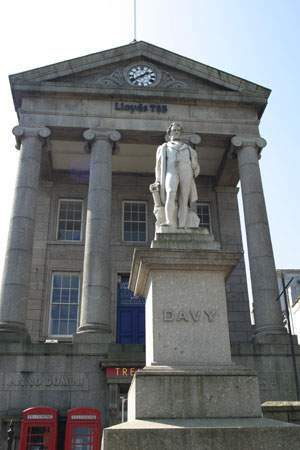 The main shopping area is located around the Causeway Head pedestrian precinct and the well known Market Jew Street with its raised granite walkway and statue of Sir Humphry Davy. For a small Cornish market town, there is a good selection of shops and stores, catering to a range of tastes. This area of Penzance also has all the major Banks and a main Post Office, as well as a good selection of bars and restaurants around Chapel street. Penzance is a great family Holiday destination, with fantastic beaches stretching Eastward from the town to Marazion and St Michael's Mount. Penzance has the only Promenade in Cornwall stretching from the Quay to the adjacent fishing port of Newlyn. As Britain's most Southerly 'large' seaside town, with a unique subtropical climate, created by the warming effects of the Gulf Stream that brings warm tropical air up from the Equator as it flows past the Cornish Peninsula. Marazion Beach located to the east of the seafront provides a safe family beach with safe, clean water, lifeguard patrol, and the convenience of the nearby town - all set against a stunning backdrop of St Michael's Mount and the Lizard Peninsula (Britain's most southerly point). Mount's Bay is renowned as one of the most beautiful bays in the world, Marazion is also a popular destination for windsurfing, kitesurfing and sailing. The beach at Marazion is mainly sand with a few scattered pebbly patches. It has ample parking and amenities along its length and its size means that it never really gets that busy. Eastern Green Beach is a quiet location with a sheltered aspect that is ideal for families looking for a tranquil beach to spend the day. The beach is reached by crossing the railway bridge or via the footpath from the bus station. The beach is sand and shingle with a gentle slope and shallow paddling area for families - where it is difficult to get out of your depth. Wherrytown Beach is a large pebble beach next to the promenade that runs between between Newlyn and Penzance. The beach is safe for swimming and is easily accessible from the promenade. Newlyn Tolcarne Beach is a pebble beach with patches of sand, adjacent to Newlyn harbour. It is popular with bodyboarders due to the actions of the waves bouncing off of the breakwater and forming the "Tolcarne wedge". Facilities are available in Newlyn. Jubilee Pool, located on the seafront and promenad, is one of the few remaining Art Deco 1930s Lidos. 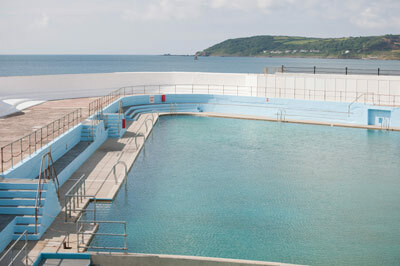 Following the restoration of this historic outdoor bathing pool, it has quickly established itself as one of Cornwalls most famous landmarks and family days out. 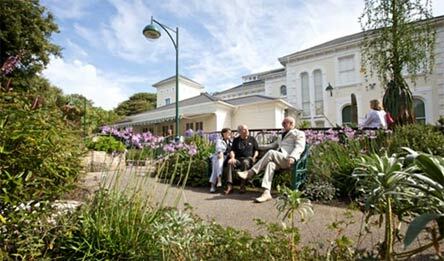 The Jubilee Pool is open every summer from the end of May to early September. The pool is a great place for swimming, sunbathing or simply relaxing. There is a small baby pool set within the main pool, that provides an ideal spot for children to enjoy the water in safety. There is a poolside cafe which is open all day. 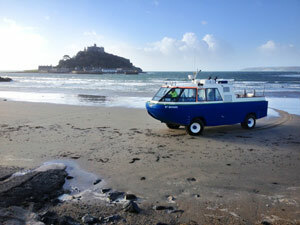 This is a unique location with superb coastal scenery from St Michaels Mount and to the picturesque fishing village of Newlyn. The Quay, (owned and operated by Penwith Council) is adjacent to the harbour. 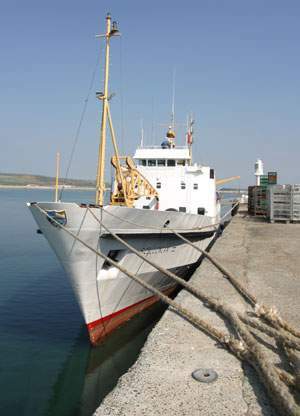 The Quay's Lighthouse pier is the departure point for the "Scillonian III", which sails daily between Penzance and St. Mary's Quay on the Isles of Scilly. 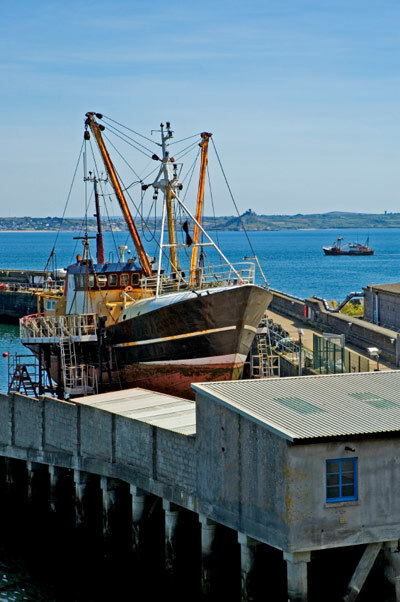 The town has a working dock, used to moor both commercial and private shipping and one of the Britain's longest established Dry Docks, established in 1834, providing facilities for vessels requiring repair and conversion. In June, there is the annual Golowan Festival (Golowan is the Cornish word for Midsummer). Although it is an old tradition, The celebrations were revived by a group of artists and local schools in 1991 in order to remember local heritage. The festival is ten days long, culminating in the Mazey weekend and Mazey Day on the final Saturday. Causeway Head and Market Jew Street are decorated with flowers and banners, leading up to the festival climax on Mazey Day, when the two streets are closed to traffic and filled with market stalls, entertainer, colourful parades and musical events. The local school children process along Market Jew street holding large paper mache and wicker creations. Golowan was one of the last mid summer festivals practised in Cornwall. In the 1890s, it was banned due to the rising insurance premiums for the towns business community. Traditionally the towns streets were lined with burning tar barrels which were paraded around. The surrounding hills had bonfires set at the top, throwing dancing shadows all around mounts bay and beyond. The settlement of the area would have been not a great deal more than this for much of its history until the sixteenth century, Mousehole being the principal harbour on Mount's Bay before then. Following the burning of the town by the Spanish in 1565, much of the infant town had to be rebuilt and it was not long before it was incorporated as a borough. In 1663 Charles II established Penzance as a new coinage town for the tin industry (see Helston), removing this privilege from Bodmin and Lostwithiel at the same time and thus marking the westward movement of mining activity. From then on the town did not look back: its maritime trade became increasingly varied and vigorous and the town developed as a market for the whole of West Cornwall. 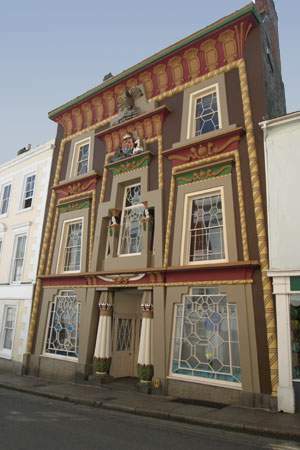 Located at 6-7 Chapel Street; the Egyptian House is one of Cornwall's most flamboyant buildings. Tucked away in a narrow street that runs from the Quay and Church towards Market Jew Street, the Egyptan House features an ornate facade of lotus columns and stylised cornices. Set in amongst the Egyptian styling and spynx like adornments is the royal coat of arms of George III/William IV maybe just to remind us we are still firmly in the British Empire. Dating back to 1835, it is believed to be the work of the architect John Foulston from Plymouth ( who is also credited as the designer of the similar 'Classical and Mathematical School' in Devonport, Plymouth). It has been said that the facade was an exact copy of a museum in Piccadilly, London built in 1812 which was inspired by the Temple of Hat-hor at Dendra in Egypt. The original owner of the Egyptian house was John Lavin, a local mineralogist. He lived here for some time and housed his extensive mineral collection in the shop downstairs. This collection was eventually sold by Lavin's son and was later donated to the Oxford University Museum. 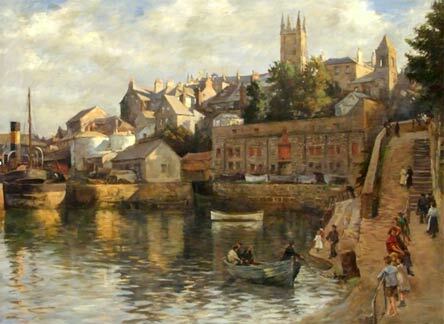 Penzance and District Museum and Art Gallery in Penlee Park has a fascinating collection of paintings by the Newlyn School and the Lamorna group of artists. The museum is set in an elegant Victorian house and park, Penlee House also covers West Cornwall's archaeology and social history, and offers an excellent café and shop.